So TWD and I picked ourselves a song a while back. I’ve written about it before. It’s a bachata version of Stand by Me by Latin artist Prince Royce. We tried to request it on the cruise during Latin Night but the DJ spoke neither English nor Spanish and wasn’t so much of a DJ as a designated button pusher. I learned to dance the bachata during a dance history course in college. But it was a small, private liberal arts school comprised almost entirely of female students so—surprise, surprise—I didn’t really learn how to dance the bachata until I started dating TWD. It’s my favorite dance with him. I love salsa but I get too intimidated by the complicated turns and while the merengue is a bit more low key, I spend most of time trying to stay on the correct foot. 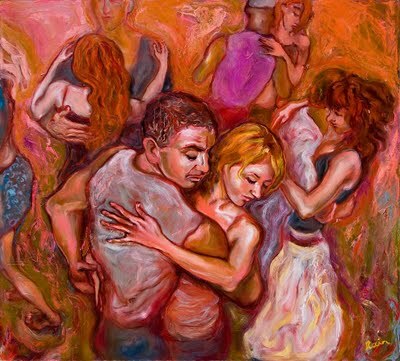 When we dance the bachata, however, I can relax. And I swear to God I fall back in love with him every time he gives me that look and takes my hand and leads me to the dance floor. But getting back to the break up. I had been asked to teach an introductory baroque dance workshop to a group of musicians studying at Bryn Mawr for the summer. And because I’m insane, I told the direction that yes, I could absolutely start the day after I got back from the Bahamas. I got all of my materials together before we left and figured I could finalize my lesson plans on Sunday night once I got back the Philly. I did not account for the fact that I would spend Sunday night bawling my eyes out. Here’s where things get a bit personal. On account of eating approximately 6,000 calories a day for an entire week, I was feeling a bit… well, I’m still afraid to go to the bathroom in front of TWD and we were sharing a room for seven days so you do the math. I opened the CD player, ready to pop in some Bach, and inside was a bootleg copy of Stand by Me. Our version. The bachata version. I had no idea where it came from. It wasn’t my CD, and TWD keeps all of his music on his phone because he lives in the twenty first century. As I stared at the CD in disbelief, wondering whether it was just a coincidence or maybe a sign of something greater, it finally dawned on me: I’d left the CD player at my parents’ rental house in Ventnor. And most of the contractors working on the house were Latino. I told them they could use the CD player whenever they wanted. The bootleg Prince Royce album belonged to one of them. I second Landlord. You’re just being mean!! I know, I know– I’m sorry. I’m still processing. I promise to post more tomorrow though. Second, this left me in just as much suspense as your last post! It was in the CA after you graduated I think 😦 I’m gonna post more tomorrow– I promise! Yeah, what??????????????? I kept looking for the break-up reason, no such luck. Well, two reasons for that: some stuff even I’m not going to put on the internet. But also, I don’t think he’s actually given me any good enough reasons. I have nubs now on my nails. Yesterday I had nails…then I bit them…today I gnawed them down to nothing. Tomorrow will be my fingertips! Aww, I’m sorry Steph! You would have wanted to kill me if we’d known each other back when I was still single. I was even worse about cliff hangers back then. But rest assured– the final installment is up! “I’m sorry,” is all I can think to say. Thanks, Zak. It’s been a rough few days but I’m feeling better now.